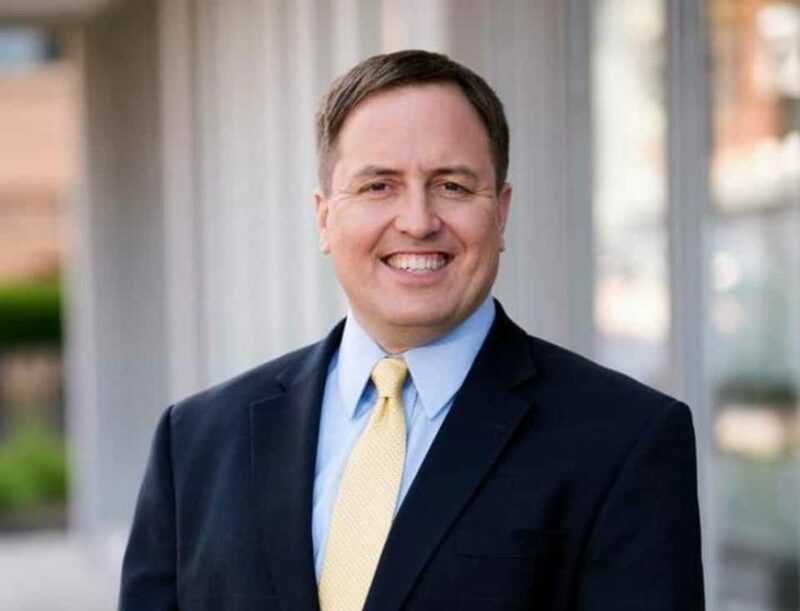 JEFFERSON CITY – John Robert “Jay” Ashcroft, 45, is an attorney, engineer and politician. Elected in 2016, he is the 40th Secretary of State of Missouri. Born in Jefferson City, he is the son of John and Janet Ashcroft. John Ashcroft is the former governor, U.S. Senator and U.S. Attorney General for President George W. Bush. Jay and his wife, Katie, have four children. I interviewed him July 10 in his office in the Kirkpatrick Building just west of the State Capitol overlooking the Missouri River. Tell me about your relationship with Christ. When I was five years old, we went to Western Hills Assembly of God Church. It’s now changed its name here in Jefferson City. I knelt down in a Sunday School chair. The pastor’s wife was teaching and that’s when I asked Christ to come into my life. I believe the Bible is the inerrant word of God and that we are all born with a sin nature. Because we are not holy and perfect, which God requires, we are all doomed to go to hell, but for the provision of the grace and forgiveness that we can receive through Jesus Christ. How does your faith inform your work as secretary of state? It reminds me that I don’t know. I think that human nature far too often is, “I’m going to do it. I know how to do it. I can do it.” One of the themes of the Bible that I think is so often overlooked is that we are not called to accomplish anything in the Bible; we are called to obedience. God will give us what we should do, and if we are faithful to do what He tells us to do, then He’s responsible for the outcome. When I get into … well, one of the areas in which I get into trouble in my life is when I sit there and say, “I got this, God. I know what to do.” And clearly I don’t, apart from Him. Politics can be a very arrogant business. You think you know what you’re doing. It’s all about you. I think we all fight against that. The concern is: how do I make sure that I’m looking to Him for guidance and His wisdom instead of, quote, “my own”? You have a lovely wife and family. Do they help keep you grounded? Let’s talk about the upcoming election and the voting process. You ran on voter ID and the Missouri General Assembly pass it into law in 2017. You have traveled the state, educating the public. Have your views changed about voter ID? Is it working the way you thought it would? Does it help protect the integrity of the process? I think it does. Any time that you are more certain that the individual voting is the individual they say they are, that they are actually registered, it improves the security of the process. But the most important thing I would say is that more people are allowed to vote under this law than under the old law. We have a handful of people that have been able to vote under this law that weren’t able to vote under the old law, because we were able to prove who they were. Under the old law, they would have been turned away. For the first time, I believe, really since Missouri has had voter registration, this office can say that if you’re registered, you can vote. It’s really despicable that some individuals would try to dissuade other individuals from voting by casting aspersions on the law. If you’re registered, you can vote, and we need everyone to get out if they’re registered and vote. Again, the way the law is written, poll workers are going to ask for a picture ID, but if they don’t have it, they’re not going to be turned away? No. In my lifetime, you’ve always had to show some form of identification. Now, they’re going to ask for that government-issued photo ID first. That’s what we want people to use. That’s what, in most elections, authorities say they see. Over 90 percent are using that driver’s license anyway. But if you don’t have that, you can still use one of the other forms of identification used previously; you’ll just have to sign a statement. That statement just states that you’re supposed to use a government-issued photo ID, you don’t currently possess one, and it informs you that the state will provide you one for free if you would like. Then you go ahead and vote. If you don’t have any form of identification with you at all, you can vote a provisional ballot, which are now, because of the law, required in all public elections. Then, once the polls close, they will verify your identity by your signature. If it matches your voter registration, then your vote will count. That’s the heart of this. If you’re registered, you can vote, yet it is harder for someone else to dilute your vote by cheating. Recently the Boston, Mass., City Council considered allowing legal immigrants – who are not U.S. citizens – to vote in municipal elections. This has raised a lot of eyebrows because these people are not United States citizens. What’s your view on that? I tend to believe that there are certain rights and privileges that come with being a citizen, and that if you’re someone who is not putting yourself completely under the laws, you’re potentially going to be leaving later on, you don’t have the U.S. passport … I think the people that are making our laws and voting on them should have real skin in the game. By that, they are citizens. They live here. They’re going to stay here. This is where they want to be. They’re worried about the effects of their vote for the future. Could you ever foresee such a thing in Missouri? I don’t see it happening quickly, but yeah, I could see it happening. There are a lot of things that have occurred in our country and in our state that 30 years ago I never would have foreseen. Are you confident, as we approach Election Day, that the process is protected? That Missourians can rest assured that their vote will be counted properly and are protected? Yeah, I am confident about that. I’d like to return a little bit to the 2016 presidential election, because there’s been a lot of talk and hubris, and frankly some headlines that weren’t correct. Everyone I’ve talked to in Washington D.C., be it in a secure environment where there was classified material that was shared or a non-classified environment, has said that all the evidence shows not a single vote or voter registration was changed. And you’re talking about in Missouri? Nationwide. That’s Missouri and every other state, including the District of Columbia. Even though the Russians apparently tried? To be honest, I think there’s a real question by people – who are not being political – as to whether or not the Russians tried to change votes, or whether they just tried to sow dissension. I think there is real evidence that there were foreign states, foreign actors, that were kind of trolls on Facebook and on social media. But there is no evidence – and that’s not just coming from Jay Ashcroft, but also from the Department of Homeland Security, the FBI and the National Intelligence Command. No votes or registrations were changed. What I’d also say, though, is, since that time, we’ve done a lot to improve our security. Our security is designed so that even if there is a breakdown on the electronic side, we have policies, procedures and statutes that can take that into account. If you are illegally, improperly removed from the voting rolls, be it because of a county clerk, the secretary of state’s office, a Russian hacker or a mouse that ate your voter registration card in the clerk’s office, there are still provisions in state law to allow you to vote. It’s a multi-layered defense. What would you say to Missouri Southern Baptists with regard to their responsibilities as American citizens and as Christians to vote? We are called to be “the salt of the earth.” You do not sprinkle the salt around the edge of your plate. Salt is effective when it’s put in the middle, when it’s mixed. We need to be active. We Christians, individuals that understand the true standard of God, need to be the conscience of our nation. We do not do that if we do not, in love, speak the truth. In 2 Timothy it says: “The day will come when they will not listen to sound doctrine.” We need to be the guidepost to warn people that they’re going off the cliff, that there is a better way that gives life and life more abundantly.